I can't say it better than this, so I am pulling this directly from the National Facebook Page here is the Chicago Page. 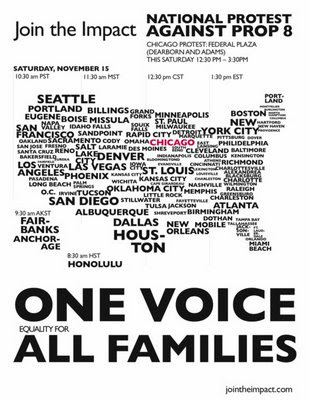 Be part of the next Civil Rights Movement - Be part of history - Join the National Protest / March for Equality on November 15th! I’m sure all would agree that with the election of Barack Obama, this week has been one of amazing wins in the world of equality! Still, Tuesday night was a bitter-sweet celebration. We came together to witness the first black man who will become our president, yet watched in sadness as Florida, Arizona, Arkansas, and California all voted down equal rights for all citizens. Pundits and bloggers alike have put their focus on Proposition 8, trying hard to find an explanation for the anti-gay wins in the face of a huge swell of support for equality elsewhere. Some have blamed the voters, others blame religious groups, and even others blame the LGBTQ community for not being able to mobilize on a larger enough scale. And you know what? There is truth in each argument. As a community, we have to admit to the fact that we are polarized in various ways. Honestly, I’m not sure what community isn’t and I believe that our polarization is proof to our humanity - we are no different than anyone else, regardless of color, creed, or sexual orientation. Still, our polarization has hindered us from mobilizing as one strong voice. We all come together in the month of June to celebrate Gay Pride, but few of us are even aware of why Gay Pride exists. Gay Pride is a celebration to commemorate the Stonewall Riots of 1969. Many say that the Gay Rights Movement began in 1969, which means that we are still a young movement and have accomplished a great deal in such a short amount of time. The generation that fought for us in 1969 deserves our gratitude and respect. This is a generation of amazing people who fought for our ability to hold hands in the street, to speak out against hate, to dance to our own “thumpa thump”, witness television shows with a queer cast, and come together in the streets celebrating for an entire month! This is the generation that opened the doors for us to even have a conversation about gay marriage, and this is the generation that deserves our help and our voices now. On June 27th, 1969, this generation came together in protest, jumping from closets, taking to the streets, and mobilizing in ways this country had never seen before! And what happened? The country was forced to respond. The Queer identity was forced onto the front pages and coffee tables of people’s worlds and people had to once and for all accept that we are human too! Now, almost 40 years later we NEED to come together again. We need to show this nation that we are ONE LOUD VOICE THAT DEMANDS TO BE HEARD! We need to be one organized unit. Our gay pride shouldn’t be something we celebrate one month out of the year. Our gratitude towards the ones who came before us shouldn’t be ignored and wasted away with one party after another. We beg to be given a right that requires responsibility and commitment, yet we, as one strong community, have not proven to this nation that we deserve to be taken seriously! The gay pride parade has become a great party, but it has lost the memory of Stonewall and therefor given the nation another reason to cast us aside as irresponsible. It’s time we come together for debate, for public recognition, and for LOVE! Let’s move as one full unit, on the same day, at the same hour, and let’s show the United States of America that we too are UNITED CITIZENS EQUAL IN MIND, BODY, SPIRIT AND DESERVING OF FULL EQUALITY UNDER THE LAW! On the steps of your City Hall on November 15th at 10:30am PST / 1:30pm EST, our community WILL take to the streets and speak out against Proposition 8 and all of the other pro-equality losses that we have faced in our lifetimes, in our parents’ lifetimes, and for many generations before us. WE CAN’T DO THIS ALONE! WE NEED YOUR HELP! We need organizers in every major city to work with us and get out the protest! I know you’re all tired from all of the work you’ve done for this great election year, but I’m asking for one more push! Let the country hear our voices together. Let them see that we are a strong, adamant, and powerful community that deserves equal rights, and CAN’T BE DEFEATED! Send this post to everyone! We have one week and must react to the pro-hate votes cast against us! Let’s help our LGBTQ friends, families, neighbors, and each other to IMPACT this country with a demand for our basic human rights! Join the cause, join the voice, and JOIN THE IMPACT!